On May 29th, police officers in Jupiter, Florida, found Woods sound asleep in his Mercedes Benz along the side of a highway. The awkwardly-parked vehicle had some damage on the driver’s side. When police woke Woods, he reportedly flunked a field sobriety test and struggled to explain where he was and how he had gotten there. Police charged him with DUI. It turns out, however, that alcohol wasn’t the culprit in Wood’s case. His system was allegedly overloaded on five different drugs: Vicodin, Dilaudid, Xanax, Ambien and THC. Woods had a fourth surgery on his back in April 2017, and some of the medicine was supposed to help him deal with that pain. But he admitted that he was trying to treat himself not only for the back pain but also for a sleep disorder. The result was a dangerous cocktail of drugs that left him confused and tired. Woods is now working with a physician to help him manage his pain and his medication. 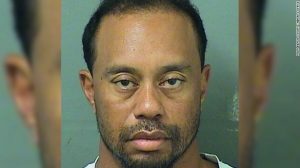 Woods reached an agreement with the prosecutor’s office that will allow him to plead guilty to a charge of reckless driving in return for attending Palm Beach County’s program for first time DUI offenders. He’ll also have to pay a fine and court costs and perform 50 hours of community service. Woods had an unusual counselor while suffering through the aftermath of his arrest. The most decorated Olympian of all time, Michael Phelps—who has also dealt with multiple DUI arrests—apparently coached Woods through this latest setback. Lesson learned: Obviously, not all of us can consult with a high-profile celebrity when life hits a speed bump. However, seeking guidance from qualified people—especially from an experienced Los Angeles DUI attorney—can reduce your sense of uncertainty and help you feel back in control. Police don’t get the chance to arrest a character straight out of a children’s book every day. But that’s what they did on June 4 in upstate New York. Sherman had accompanied another person to a private home, and the resident of that home eventually asked him to leave and then tipped police off to the actor’s condition. The New York State police reported that he had a blood alcohol concentration of 0.19, twice the legal limit when they picked him up. Lesson learned: The callous comments that people made about this incident online (along the lines of “this tin man needs to get a brain,” etc.) are sadly par for the course in today’s society. Even if you were unfairly arrested—or if you face unfairly aggressive charges—it’s hard to win sympathy as a Los Angeles DUI defendant. A crisis counselor who claimed to be God lost his cool when deputies from the Pitkin County Sheriff’s Department charged him with DUI in late June. According to the Aspen Times, Garth Edwinson, 44, of Lakewood, Colorado, had been driving in both lanes of Highway 82, when a deputy spotted him and tried to pull him over to the side of the road. But Edwinson allegedly ignored both the flashing lights and the deputy’s later request that he remain in the car once he finally pulled into a hotel parking lot. Edwinson stumbled into the hotel entrance but couldn’t make it through the second set of doors before falling. The real irony is that apparently Edwinson had spent the week before his arrest in Aspen, playing roles in crisis-intervention scenarios used for police training. The goal was to teach police officers how to deal with people who are in crisis due to drugs, alcohol or mental illness. Edwinson’s acting out in this late-night scenario didn’t win him any good reviews from the arresting officer. They charged him with DUI, resisting arrest, eluding and careless driving. Lesson learned: Don’t give a false name (or other false information) if police pick you up for DUI. Why compound your legal challenges needlessly? It’s fine to celebrate your birthday with a few drinks. But it’s not okay to go back to work after a long night of drinking beer and tequila shots–especially if your job involves driving a school bus with 31 students on board. The children from Loganville Middle School in Walton County, Georgia, had a nightmare ride to school as Carole Ann Etheridge crossed the center line into oncoming traffic several times, stopped the bus in the middle of the road and even missed the entrance to the middle school where she was supposed to drop off her passengers. The students called their parents, who called the school. A school resource officer administered a breathalyzer test to Etheridge, who allegedly blew a .089. The officer also claimed to have found several open containers of alcohol, including tequila, inside her purse. Etheridge is in double trouble, since the legal limit for bus drivers in Georgia is 0.08. She’s already lost her job, and police have charged her not only with DUI but also with child endangerment for the 16 school kids under 14 who were riding her bus. Lesson learned: “Take the bus” isn’t bad advice for most people who are contemplating driving when they’ve had a bit too much to drink, but that doesn’t apply to people who are getting behind the wheel of that vehicle. Elwood Gutshall had been doing some belated St. Patrick’s Day celebrating when he was picked up for DUI in Newville, Pennsylvania, on March 19th. At a little past midnight, police officers observed him committing multiple traffic violations and pulled him over. After determining that he wasn’t in any condition to operate his green Ford pickup truck, the police took him to the Cumberland County booking center for a blood draw. Gutshall’s BAC measured .217, more than twice the legal limit. At the time of his arrest, Gutshall was wearing a bright green tee-shirt emblazoned with the slogan “Drunk Lives Matter.” There’s no word on whether or not police found that shirt amusing. But Gutshall probably didn’t have much to laugh about by the time his night was over. Police charged him with DUI, driving under a DUI suspension and several traffic violations. Lesson learned: If you’re going to drive DUI or otherwise engage in reckless acts behind the wheel, it’s probably best not to antagonize police officers by wearing a provocative tee shirt.